2. Clean and clear all floors, even closet floors. Mop all tile and vinyl floors. Sweep all concrete floors. 4. Remove all pets. Fish bowls and aquariums may remain if properly covered and the air pump is shut off during treatment, but be sure to ask our professionals for specific directions. 5. Wash or dispose of all pet bedding. If laundering, wash pet bedding separately from other lines. Fleas are small insects (under 1/4 inch) and are dark brown in color. They lack wings and are extremely narrow side to side, which enables them to move easily through the body hairs. Their last pair of legs is modified for jumping. They have numerous spines and hairs on their body, and their mouthparts are adapted for piercing the skin and sucking blood. The whisker-like spines on and near the head are important characteristics used in the identification of fleas. 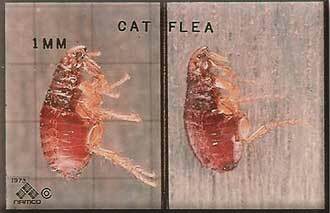 Three kinds of fleas are important in Pennsylvania - the cat flea, Ctenocephalides felis; the dog flea, Ctenocephalides canis; and the human flea, Pulex irritans. The cat flea is the most common type found in the Commonwealth. While this flea is usually found on cats and dogs, it will attack other animals and humans as well. The life cycle of a flea consists of four stages: the egg, the larva, the pupa, and the adult. Eggs are deposited either on the pet, in the pet’s bedding, or in cracks and crevices of floors. Eggs placed on the pet are not firmly attached and soon fall off. In about a week, the eggs hatch into immature fleas called larvae. Flea larvae are very different from adult fleas. They are wormlike, lack legs, and do not feed on fresh blood, but live on organic matter, including dried particles of blood and excrement voided by the adult fleas. In about 12 days, the larvae are fully grown and change to the pupal stage which then changes into the adult flea. Adults feed more than once a day on fresh animal blood. They may live as long as a year and in some cases, even longer. Fleas may be present, though unnoticed, all year in the house but frequently become troublesome following return from a vacation. Fleas inside an empty house soon become extremely hungry. 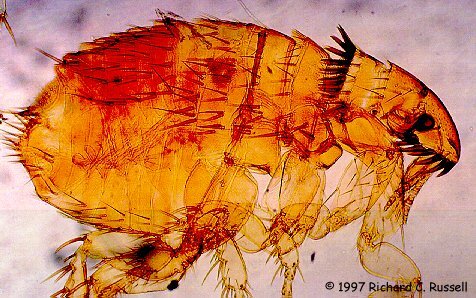 When the vacationers return, they are greeted by these neglected fleas who now make their presence known by biting avidly. Flea bites on humans are generally most prevalent on the ankles and lower portion of the legs. 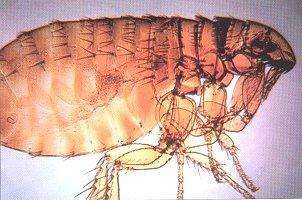 Fleas can transmit a number of diseases to man, most important of which is plague. In the 14th Century, this disease, known as the “Black Death”, killed a quarter of the population of Europe (some 25 million people). In 1665, an epidemic in London killed 70,000 persons out of a total population of 460,000. In 1900, the plague came to North America. From 1900 to 1925, 432 cases were reported in the United States. There have been no epidemics of plague reported in the United States since 1925, but plague is present in the wild rodent populations of the western states, and generally a few cases in plague, in humans, occur each year from this source. In 1980, nine cases of plague were reported (five from New Mexico, two from California and two from Nevada). Murine typhus, a disease primarily affecting rats and mice, can be transmitted to man by infected fleas. 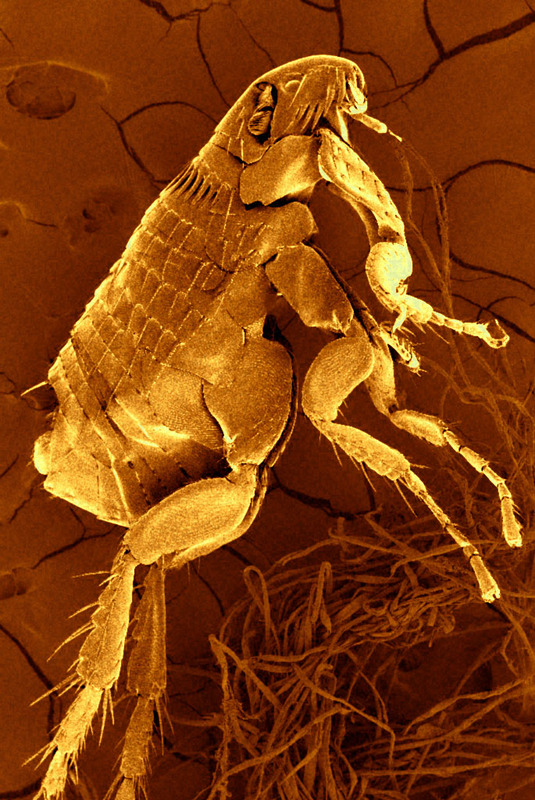 When a flea feeds, it usually defecates at the same time, and it is believed that the transmission of the murine typhus pathogen occurs by scratching the infected feces into the would. About 40 cases of murine typhus are reported each year in the United States. It is important to have an on-going pest control service. With Our quarterly pest control service, you wont have to worry about being re-infested with fleas. Plus once you are on a quarterly service, many other pests will be included in the agreement.